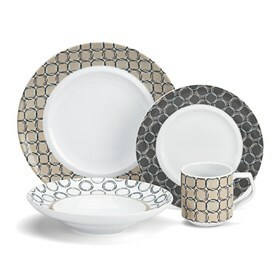 The Cuisinart CDP01-S4C is a 16-piece porcelain dinnerware set which lends an instant elegance to any meal. Cuisinart dishes are designed and crafted of the best quality highly durable glazed porcelain. It has bold and vibrant colors along with delicate texture or design that offers a variety of beautiful patterns and make every meal special. The Chalais Dinnerware Collection Porcelain 16Pc Set has many exciting features for users of all types. The Chalais Dinnerware Collection Porcelain 16Pc Set is sold as a Brand New Unopened Item.